On 1 December Batallion Kolbeck, a thrown together unit consisting of about 500 lightly armed recently released German POWs from Afrika-Rgt. 361, as well as cooks and other B echelon (supply troops) personnel of infantry, artillery and flak units of or attached to or from 90th Light division, reinforced by some heavy weapons, was launched into a supporting attack from the north towards Belhamed. This was one prong of a pincer attack to retake the height of Ed Duda. The other pincer was supposed to be provided by the Italian Trento division, with the support of five tanks from 15. Panzerdivision. But the tanks never showed up, them being busy elsewhere, and Trento’s command wisely decided that without armour support they would be on a hiding to nothing. Unfortunately for Batallion Kolbeck, that meant they were left alone to face the formidable Commonwealth defenses. Overall, the plan of attack was based on a flawed intelligence appreciation about Commonwealth forces in the break-out salient, a flawed understanding at higher command levels of what could still be asked of its troops, and flawed co-ordination of the attack. Looking at the records, the decision to pursue this attack with this force is difficult to comprehend, and it is one more example of the command failures of Panzergruppe during the battle. Battle around this sector had been raging for days (see this older post for events on 29 November). The proposed attack was following the rather successful attacks against the New Zealand Division, which the day before had suffered severely, and had to give up its hold on the corridor. On the other hand, the Axis forces had been too weak to really re-establish a close siege line, and most importantly had failed to dislodge the Tobruk garrison forces from the Ed Duda salient. The command of 90th Light seems to have assumed, trusting information from the other formations, that there were few enemy forces and no tanks left in the salient and ordered this scratch unit (its only battalion left judged capable or available for attack) with some heavy weapons support to attack, while Panzergruppe expected 90th Light to cross the salient and re-establish the siege, retaking all the strongpoints lost during the breakout. Needless to say, Batallion Kolbeck completely failed, with considerable losses, and Panzergruppe seems never to have been told that this was the only remaining unit within 90th Light capable of taking offensive action (or so they thought). The incident is well covered in the official histories of Australia and New Zealand, probably because it came at a critical point in the battle, maybe because it marks the passing of the high water mark of the Axis effort to crush the salient and maybe because the German attack fell apart with heavy losses, a performance that was unusual, to say the least. Then as a result of enemy movement on the north and west sides of Belhamed a warning was given that an attack on Ed Duda was expected. Burrows returned but the attack did not develop. Later in the afternoon enemy infantry and three tanks advanced from the east as though to cut the corridor in rear of the battalion and a heightening of artillery fire in the west indicated a possible converging thrust from that quarter, but the force attacking from the east did not press on when shelled. A German infantry advance against the 1 /Bedfordshire and Hertfordshire, supported by a heavy volume of small arms fire, was checked, and the New Zealanders drove off a party that simultaneously approached their headquarters . 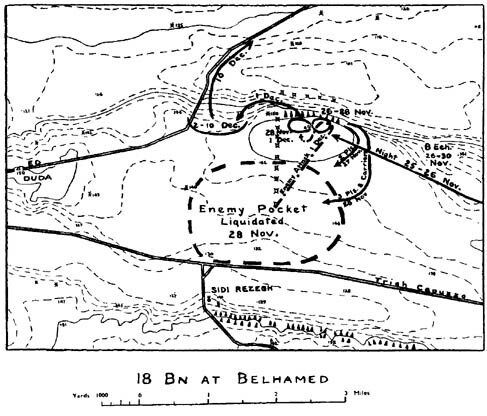 One company position at Bir Belhamed was penetrated, however, and isolated English pockets anxiously held to their ground throughout a confused night. At first light some Germans were captured but the enemy reorganised and about 9 a .m. a sizable force of infantry assault engineers and anti-tank gunners made a crude attack. The Beds and Herts showing cool discipline held all fire until the enemy were close and then engaged them with crippling effect . The Germans turned and made for the ridge to the north only to run into sharp fire from the New Zealanders, who effectively disrupted a none too orderly withdrawal . Once again a German assault on the Tobruk sortie force had gained nothing but had cost the German command many killed, wounded and captured . Some had been taken prisoner twice within a fortnight . Many of them belonged to a newly formed infantry unit of the 90th Light Division, called after its commander the Kolbeck Battalion, which was composed largely of men released from the New Zealand prisoner-of-war camp overrun in the German counter-offensive on 28th November . On the saddle between there and Belhamed 18 New Zealand Battalion repulsed a light and poorly-staged attack (by Kolbeck Battalion, an ad hoc unit of 90 Light) after dark on 1 December and helped to defeat a much heavier attack next morning. This came mainly against 1 Bedfords and Herts to the left rear, and this unit drove the enemy northwards in considerable disorder. In the course of this fighting it became apparent that the morale of General Suemmermann’s troops had deteriorated and their offensive potential was now negligible. Kolbeck Battalion suffered crippling loss in men and equipment, and 605 Anti-Tank Battalion, 900 Engineer Battalion, and III Battalion of 347 Infantry Regiment met with some loss, particularly in anti-tank weapons. To 18 Battalion, on the other hand, the action was salutary; it cost only seven casualties against many times that number of Germans killed, wounded or captured and helped to restore any confidence that had been shaken by the fighting on Belhamed. At about 1900 hrs [1 December] a night attack was made on the Bn. by enemy infantry from the north. This attack was easily repulsed with LMG and rifle fire. At about 0630 hrs 2 Dec 41, a new attack was started from the north by at least a Bn of the enemy with arty support. This attack was also repulsed with heavy loss to the enemy by 0900 hrs. We suffered 7 casualties. The remainder of 2 Dec 41 was one of comparative quiet except for movement of the enemy outside small arms range. Arty fire was brought to bear by 1 RHA who had sent an FOO to the Bn. Late in the afternoon considerable activity by the enemy was observed on belhamed and an attack from that direction was expected. After considerable difficulty it was found possible to get two A/Tk guns (Polish) through Beds and Herts Regt, and five I tanks from 22 Armd Bde…. 1 RHA arranged a complete defensive fire plan. No attack developed and night ⅔ Dec was quiet. 90 reinforcements were sent forward from B Ech of 18 Bn and 20 Bn. 10 18 Bn reported and took away all wounded, except stretcher cases, and some 50 officers and ORs of a German and Italian hospital in the Bn area. On 3 Dec much enemy movement was visible east and south of the posn. Recce patrols were sent out and at time of writing it appears that the enemy is holding a defensive line sidi resegh-belhamed-bu amud…. An attack on the enemy has also developed further south from apparently some portion of our own troops. Wire has been received from Beds and Herts Regt and 600 mines have been promised. It is proposed to further consolidate the posn on night ¾ Dec. The morale of the tps is good…. The present strength of the unit, including attached from 20 Bn, is 17 Offrs and 528 ORs…. It is emphasised that for a considerable period this Bn has been placed in posns of extreme difficulty with three sides open to attack and with little support available. Great help has been received in particular from 1 RHA and their FOO…. Early information about plans for our future action or movement would be appreciated…. This bald account fairly effectively conceals some very sound work by 18 Battalion, beginning shortly after dark on 1 December, when the alarm was first raised that Jerry was coming in on the north-east flank. The Brens facing that way opened up forthwith, the riflemen round them joined in with enthusiasm, and very successful their efforts were, for Jerry halted and dug in where he was, down below the escarpment. After the morning’s events the battalion was not at all disposed to let sleeping dogs lie. The Brens continued to give Jerry what one man described as a ‘good pasting’, but Jerry stuck to his new position, and a little later in the evening sent in a few shells which rather cramped the battalion’s style. All that night fingers in 18 Battalion were very ready to triggers, but Jerry did nothing till daybreak next day, when a sudden storm of shells arrived, followed by the enemy infantry, whose numbers, now that they could be estimated in daylight, looked like 200 or so. Reaction was swift. Brens and rifles opened up, followed by the Royal Horse Artillery, with an effect so rewarding that even the 18 Battalion boys were astonished. Under the shelling and accurate sniping the German troops broke and ran—a rare spectacle—and as they did so more and more troops rose out of the ground and joined them till the estimated 200 had swollen to a battalion at least. They did not stop till they reached a small ridge 800 yards away, where they rallied on a line of tanks in hull-down positions. Jerry had now lost his first advantage of surprise, and all the advantage of ground lay with 18 Battalion, which could overlook the whole situation. To some men it looked as if the tanks were driving the infantry back into the fight, but that might have been a bit far-fetched. There was certainly much activity over in the lee of the little ridge, staff cars buzzing about and the Germans obviously making ready to come again. But the fun, when it began again about 7 a.m., was shortlived. The German infantry this time made almost no progress; the Royal Horse Artillery (for whom the 18th was beginning to cherish a warm regard) opened fire again and broke up the advance, helped by three opportune British tanks which appeared out of nowhere. That was the ignominious end of Jerry’s attempt on 18 Battalion from the north. During the rest of the morning the infantrymen and artillery had intermittent sport shooting at small enemy parties which from time to time rose up from the ground and made a dash for safety, and in the afternoon the pioneer platoon sent out a patrol and helped the Bedfordshire and Hertfordshire Regiment to round up some 150 Germans who had hoped to lie doggo till dark. They might have got away with it but for an accident—an enemy car travelling injudiciously up the bypass road had stopped when fired on, and a carrier which went to investigate had stumbled on these hapless Jerries in the vicinity. Exposure for hours to drizzle and cold wind (for 2 December was a foul day) had sapped their resistance, and they surrendered without argument. They were herded up and marched off to the ‘Beds & Herts’ lines, with 18 Battalion interestedly watching from its vantage point. The history of these abortive attacks from ‘the other side of the hill’ is interesting. While the morning attack on Belhamed on 1 December was in full swing, Africa Corps asked 90 Light Division to attack from the north, the idea being to trap the Kiwis between two forces and crush them, nutcracker style. The 90th Light agreed with alacrity, but promise seems to have outrun performance; the best unit it could find for the job was a makeshift, poorly armed battalion, commanded by the divisional adjutant and composed of odds and ends, supply troops and the like. as 90 Light Division itself admits. Its unfortunate commander, hauled over the coals later, could offer no convincing explanation—the men, he said, had ‘bolted leaving behind their A Tk guns and other weapons’. Not an inspiring page in the history of German military prowess—but what a tonic for the battle-bruised 18 Battalion, whose morale had inevitably suffered a little in the cataclysm of 1 December. While these write-ups in the histories make things look like they were very tidy from the Commonwealth side, one has to remember they were written after the war, by authors who had access to the war diary and reports of 90th Light, and are thus subject to a certain amount of hindsight. A rather different picture is given by the operations report for 2 December 41 by 4 RTR, a Matilda tank regiment operating on Ed Duda which was involved in breaking up the attack. Issued operation orders for the day. All quiet for the moment after battle at BELHAMEDlast night (this maybe the night action Kolbeck refers to, but which is not mentioned anywhere else). Battle developed vicinity of BIR BELHAMED. This maybe the preliminary to an attack on the North of DUDA. BIR BELHAMED held by the Beds and Herts. C.Os. orders were to give any help possible. Decision to be taken whether to send tanks to assist and possibly weaken DUDA which may be attacked in turn any moment or keep them and let the Beds and Herts carry on unsupported. On the other hand no information that enemy are in vicinity of it at the moment, whereas if they overrun the the BIR BELHAMED position, they will be behind us here and can put guns to shoot up our tail. 13 tanks, on top of DUDA (Capts. Kendall and Gardner). 4 tanks, in reserve at HQ (Major Roberts). His left, forward and North to watch WOLF (one of the old objectives of the break-out). His right, to advance and engage enemy tanks that now appeared South East of BIR BELHAMED and advancing to attack Beds and Herts. There are eight of these Mk IIIs by the the look of them. Major Roberts with 4 tanks to move directly forward East to demonstrate towards enemy. This will have the effect of putting tanks on both flanks of them. 0750 – considerably firing in vicinity of BIR BELHAMED. It looked as though Beds and Herts were surrounded by enemy tanks and infantry, and that they had surrendered, and this was confirmed by an Officer of the Australians who said he could see them. Message from Major Prichard to say enemy had withdrawn, and that BIR BELHAMED was in our hands and had been all the time. He also says that considerable number of weaponless Germans who had surrendered are now walking over a minefield and escaping. Asked what to do. C.O. told him to fire on them. Later he reports that they returned when he opened fire. They were later taken in charge by the Beds and Herts. Enemy did not engage with tanks at all. Major Roberts had some shooting, but as far as could be seen, his shells bounced off the enemy tanks. Hear that the Mk IIIs have been reinforced. Enemy withdrew North East. Beds and Herts shot up Major Prichards tanks on sight. SOme Germans came near the Beds and Herts and called out that they were Poles, but this did not save them at all. It was now established that the N-Zs at the corner BELHAMED were still in position too, and happy. The rumours that (a) The Beds and Herts had surrendered. (b) The N-Zs had been scuppered. (c) That the enemy held the whole of BIR BELHAMED are thus fables. Most of our information appears to be fables. 1330 – All has been quiet for a while. 1400 – Information that enemy are advancing from the East along the escarpment. Major Prichard lost two tanks on a minefield when he advanced on BIR BELHAMED. This cuts tanks down to 25 effective. Adj. tank is doing rear link and not available for fighting (unless things are desperate). 1315hrs – the order to attack is also given to Battalion Kolbeck which consists of released prisoners from the Afrika regiment (former Foreign Legion men) and B Echelon personnel with minimal weapons equipment. 1520hrs – Battalion Kolbeck stands south of airfield with 4 Italian AT guns and waits for order to move out. 1610hrs – German planes bomb the british cauldron north of Belhamed (according to a New Zealand gunner, they actually bombed a a column of15th Panzer). Despite repeated request no answer from Corps (DAK) regarding permission for Battalion Kolbeck to attack and time to start. 1640hrs – Pz.Grp. orders closing the gap between Italian XXI. Corps south and 90th north by attacking. Forces are lacking for this. Because of fault on phone line and congestion on the radio net it is not possible to inform Grp. of the failure to carry out its order. The subordination to DAK, which gives new orders, the transmission from Gruppe is no superseded. 1815hrs – Magen Belhamed reached. No enemy contact yet. 2000hrs – 1km south Magen Belhamed defensive fire from MG and AT guns. Shortly after heavy enemy artillery fire into the attack of Btl. Kolbeck. The Btl. goes to ground and can not advance one step more. Captain Kolbeck has doubts whether Belhamed is even in German hands already, since he received heavy fire from Belhamed. In several discussions with 15th and 21st Panzer Division, to which there is once more phone contact, it is confirled that Belhamed is in German hands. Thereupon radio call to Btl. Kolbeck. Meanwhile – 1945hrs – question from Panzergruppe why its order to close the gap southwards to Pavia across the old strongpoints (lost to Tobruk garrison breakout earlier in the battle – see this older post) had not been carried out. Pz.Grp. declares agreement with measure after divisional commander explains (division under DAK since 1845hrs) and who points out phoned order from DAK to take Belhamed from the north. 2220hrs – two heavy tanks (Pz IV) arrive at the CP. 0620hrs – report that Btl. Kolbeck has reached the Ital. positions 1km north of the Axis road serpentines (Belhamed). 0700hrs – Captain Kolbeck intends to attack with left wing on 700m frontage along the serpentine towards the east to neutralise allegedly present English remaining elements. Attack gets stuck. 0705 – heavy enemy artillery fire on Btl. Kolbeck. Enemy attacks from Sghifet ed Duda with infantry (no tanks). Fire of several batteries from Tobruk on Btl. Kolbeck. 0730 – the two tanks which arrived during the night roll up to the support of Btl. Kolbeck and take with them the remains of Pz.Jg.605 (a formation of self-propelled lightly armoured 4.7cm AT guns) and help the hard fighting Btl. Kolbeck. The English attack breaks down. 0820hrs – the divisional commander drives to the frontline to personnaly orient himself about the situation of Btl. Kolbeck. Returns after 2 hours and again – 1000hrs – the Zafran appears to be free of enemy, while the Belhamed is lightly held. It appears unclear to all why Btl. Kolbeck has not advanced further. 1015hrs – Captain Möller receives the task to establish contact with DAK because Btl. Kolbeck can not advance since 0700hrs. The combat power of the newly established incongruent battalion is very much weakend by the enemy artillery fire and the attack. 1040hrs – a tank attack by 9 tanks is repulsed by our Pz.Jg. company by simply appearing. Nevertheless the elements of Btl. Kolbeck are flooding back to the Via Balbia in complete confusion. They are there at the Axis cross caught by an orderly officer of the division and brought back to the supply officer to recover. The Pz.Jg. stand ready to defend at km 7 of the Axis road. Pioneer battalion 900 holds Point 130. Btl. Kolbeck moves back to Point 126 north of the Axis road and should hold a line strongpoints 903 to 900. 1235hrs – Captain Kolbeck reports to the divisional commander on the situation of his battalion. He states that the men made off, leaving behind their AT guns and weapons. Wounded and dead were caused primarily by artillery and MG fire. Night completely quiet. Some men of Btl. Kolbeck manage to return under cover of darkness. A complete weapon loss report of the division except S.R.155 and Afr. Rgt. 361 is handed to DAK. The two further reports by Captain Kolbeck below are the German first-hand and unfiltered side of this fight, and were a response by the him as battalion commander to the criticism of the performance of his unit on those two days. They are appended to the war diary of 90th Light. The first is a neat illustration of the chaos of battle. Wargamers in particular sometimes seem to have trouble comprehending that a WW2 battlefield was a chaotic place, in which orders and units got lost or were simply not carried out because they conflicted with the instinct of self-preservation. The report includes all the chaos one can presumably expect on a battlefield. Vehicles break down, units retreat or advance in the wrong direction against orders, units leave the battlefield during fighting, units get lost. To the 90. le. Division. 1 light Infantry Gun (short-range 7,5cm howitzers) platoon with 2 guns commanded by a Corporal. The platoon of 3,7cm AT guns had the task to protect in leapfrogging advance in the right wing and the right flank of the battalion against tanks during the attack. During the night fighting it was also used against machine gun targets. During the night one vehicle broke down with engine damage. During the continuation of the attack on 2 December the platoon took over tank protection of the right forward company, guns moving down-hill towed by their crews. When the largest part of the company moved east against my orders and retreated north, the tank hunters followed on the order of thier platoon commander after removing the bolts, breeches and optics, carrying the latter with them. The guns were left behind. The 2 i/c of the platoon reported to me on 3 December after he had been with Battlegroup Briehl until then. He and his 13 men with their light weapons were integrated into the 2nd company. Lieutenant Gewehr is allegedly wounded. Of the 5cm AT guns one gun fell out during the first kilometres already, allegedly because of engine damage on the towing vehicle. The second gun had the task during the early morning of 2 December to protect the attack leftwards against enemy tanks from the assembly area. It was supposed to follow the left forward company as soon as this reached the valley bottom. During the the evasion, against orders, of the leftward company and the elements of the battalion pushed left, the gun suddenly limbered up and moved back. No catching up with it was possible. A report to the straggler collection point, which could not have known to the platoon, was not made. The light infantry gun platoon had the order to follow the attack on 1 December 41 at the head of a company echeloned back leftwards, and be available to me. When I wanted to call up the platoon for direct fire on an English strongpoint during night combat, it was not available. It also did not reach the later assembly area. Several hours of searching during the night remained fruitless. One has to suppose that the platoon lost contact, moved in the wrong direction, was taken prisoner or returned without orders to its unit. The reorganisation of the remains of the battalion to a two-company structure has been carried out. A further 32 NCOs and soldiers have reported as stragglers. One officer and 62 NCO and soldiers of 2./Afr.Rgt.361 are still on the march from the rest area of A.A.33 according to a sergeant. If they arrive it is intended to form a 3rd Company. No new arrivals for weapons. It was ascertained that a large part of the lost light MGs and 3 AT rifles was taken back on their own accord to their various units by the members of B Echelon who originally sent them. A report to the straggler collection point was not made. An order to recover the weapons has been issued by the supply officer of the battalion. Equipment and weapons of the soldier was improved. Seven large tents were organised. The mood amongst the troops is very good under the current circumstances. Battalion personnel officer: DAK was sent loss and shortage report by radio on time. Shortage 22 officers, 74 NCO, 649 soldiers. A more detailed follow-on report will come in writing and as soon as line fault is rectified by phone. The numbers are partially estimated. III./I.R.255 and Signals Command are not considered in loss and shortage, and Afr.Rgt 361 only for those recovered from prisonership and used here. Despite the performance (or rather lack of it) during the battle for Ed Duda, Batallion Kolbeck was kept as a unit until at least the retreat to Agheila. Of further interest maybe that Captain Kolbeck was an old acquaintance of Rommel. He is mentioned a few times in ‘The Rommel Papers’. Apparently he was assigned to Hitler’s HQ and was sent out to accompany Rommel on his march west through France in the final stages of the campaign there, with no specific role. He seems to have survived the campaign in Africa and was taken prisoner when Panzerarmee Afrika surrendered in Tunisia in 1943. He is one of the old acquaintances mentioned by Rommel in a letter to his wife, wondering how they were doing in captivity. I am guessing that Rommel met him when he was serving as commander of Hitler’s bodyguard. This entry was posted in Content and tagged 4 RTR, 90th Light, Axis forces, Belhamed, Combat report, ed Duda, New Zealand Division, Tobruk. Bookmark the permalink. Good post on a hard fought battle. Yes great job on an unkown hard battle. I would be happy to read some infos on Arko 104 which fought heavily in the same area a week before. Did you plan to write something on it ? I will be published on this matter in june. Excellent news that your article on the artillery will come out soon. In French I presume? Please feel free to post a link here to where it can be purchased. here it is, the first part in the latest issue of french review “batailles & Blindés” n°31. First part on units, and second part on tactics and some operations (with a focus on KG Böttcher battles around Sidi Rezegh kessel). That looks like a good article Cedric! Congratulations, and I look forward to reading it. 1830	It was now dark and suddenly considerable small arms fire started and many spent bullets were arriving in the Rocket Troop Gun Area. This turned out to be some enemy tanks and infantry that had advanced towards Bir Bel Hamhed, 428 412, and were attempting to capture our forward positions. B.C. moved Rocket Troop back to join “B” Troop in the old position about 422 420. Simultaneously, enemy infantry had advanced towards New Zealanders Battalion H.Q., about 4292 4108, and were attempting to make them surrender. However, the enemy were heavily engaged and were made to withdraw. “B” Troop, after moving back during the night had gone into action in an open position about 422 419 and were extremely heavily shelled by 75mm. Fortunately there were a large number of ‘duds’ and nothing more that [sic] a 75m.m., with a result that, although a large number of shells landed near and amongst each gun pit, there were no casualties. The Troop was moved, by Sections, keeping one Section in action, being shot by the O.P. the whole time. 1000	Enemy infantry advanced on Bel Hamhed position from the N.E., but the attack was soon repulsed by Small Arms and Shell Fire. Lieut. Coulson did some excellent shooting. Capt. Hay did good work as Liaison at Battalion H.Q. A number of prisoners were taken as a result of this enemy attack. 1900	Situation quiet, enemy attack completely beaten off. Great stuff Tom, very many thanks!